Description: Project Manager $1 million update of system from analogue to digital. 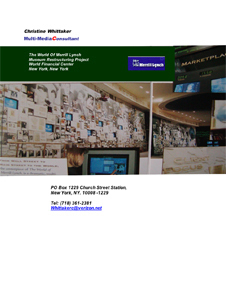 Merrill Lynch Audio Visual Museum restructuring project, World Financial Center NYC. 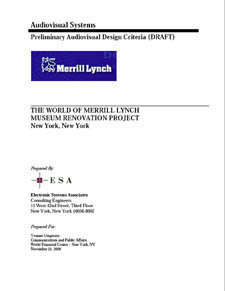 I worked very closely with John Bilodeau and ESA to dissect the control and audiovisual problems that existed in this integrated system, reviewed equipment repair logs and monitored oscilloscope diagnostics for failure (such as the replacement of MOV’s in the Leibert generator). Post all diagnostics I developed a plan for analogue to digital conversion of the museum A/V system, as well the integration of the dormant museum back end. The museum-restructuring project went on hold and closed due to the events of September 11, 2001. A Laurie Anderson, Peter Gabriel (Real World Records) & Brian Eno Project. The 1st. x experience park designed by new media artists. 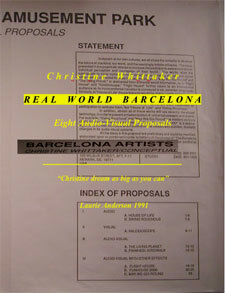 Real World Barcelona was a Laurie Anderson, Peter Gabriel, Brian Eno project. I was asked by Laurie Anderson to submit proposals for their then in planning stages interactive amusement park. The park instigated by Peter Gabriel was a way to bring contemporary artists and audience together. Real World Barcelona was the first artist designed amusement park in the world. For the project I submitted (8) proposals viewer interactive and immersive rides (52 blueprints and written text). 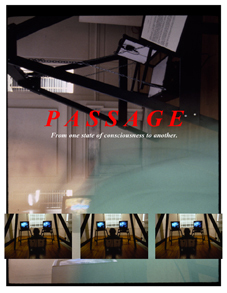 As well I built “Passage” (as a smaller version of (1) proposal called “Flight”) a viewer interactive audiovisual ride that altered brainwaves, it exhibited at the Delaware Center for Contemporary Arts. It was the first viewer participant interactive installation exhibited. I was also the NEA Grant administrator for the $60,000.00 ($20,000 Annually) National Endowment for the Arts Experimental Arts Grant /Pilot Program. 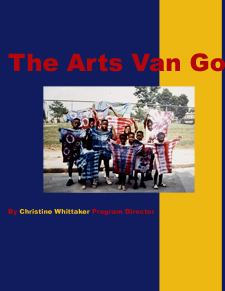 Hired by Christina Cultural Arts Cente (a private institution) to develop a first of its kind, fully mobile arts studio that offered arts, crafts, literature and modern dance to the inner city youth of Wilmington, Delaware. I developed and built a fully mobile arts program. 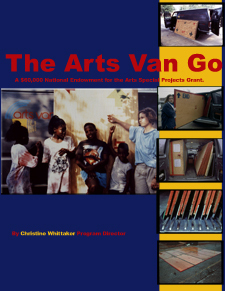 First, physically retrofitted the van with racks to support arts supplies, silkscreen, video support and a mobile dance floor. I also was the coordinating administrator for the arts, literature and dance programs and instructors of which we collaborated on syllabi that integrated well with the communities we serviced. This was a very unique challenge that was successful in bridging the gap between Christina Cultural Arts Center and the surrounding community. The program was later duplicated in other cities in the United States.